This post is about making a super duper delicious pumpkin ale meat sauce. For pasta. With roasted butternut squash. And sage. And Parmesan. And cream. And pumpkin seeds. Basically a harvest kind of meat sauce. And if the pasta is pappardelle, all the better. As much as I wanted to see summer linger for another week or two (like last year) I need to accept the reality of Fall’s arrival and this is one of my ways of doing so. This sauce turned out really good, so I am officially tagging it as a Perrine Original Recipe (as opposed to a Perrine Take on a Classic Recipe). Remember how I wrote that I will be tagging all of our Cooking with Craft Beer and Pairing Craft Beer with Food recipes with one of these tags? Done. Only took me three months. Still to decide on a creative way to use the tags. One day the blogging thing will come to me, I am pretty sure. Unfortunately, it does not get rid of pumpkin spice aromas. Therein lurks the problem. Most pumpkin ales are crafted so as to convey pumpkin spice (I get it if you just said “Duh”:), promote it if you will and we’re just not into drinking pumpkin pie or pumpkin spice lattes disguised as beer. So sorry if you are a fan of pumpkin ale and think that we are totally doing it injustice! Please be understating. For our pumpkin ale meat sauce I chose ground turkey because it is almost neutral flavor wise and very receptive to flavor infusions coming from ales, spices or other ingredients. Plus, I just love how the longer you simmer ground turkey in a sauce, the more it melts into the sauce. If you use a slow cooker, it can almost disappear into a sauce – like with this Farmhouse Ale Turkey Chili. Because the sage roasted butternut squash has a mild sweet flavor, accentuated by salt & pepper and because grated Parmesan imparts nuttiness to the sauce during the simmering over low heat stage the pumpkin ale simply shines here. It shines people! Elevates the sauce to a whole new level that chicken stock or milk could not touch. I will leave you with a short video demonstration (feel free to use whatever pasta makes you happy) and the full recipe. Bring it on pumpkin ale season! By the way, Chris is putting a very similar sauce on his Fall menu this year. Yum! Forgot to mention that we paired with Dunkel. For obvious reasons we shied away from pumpkin ale. Heat up oven to 400 °F. Peel the butternut squash, slice it in half, clean the seeds out and dice it into 2 inch cubes. Place in a bowl and drizzle with 3 tbsp olive oil + sprinkle salt and pepper to taste. Add the fresh sage leaves and toss well. Spread over a parchment paper lined baking sheet. Roast for 20 minutes, take out of the oven and set aside until needed. In a frying pan over medium heat sweat the onions and garlic in 2 tbsp olive oil. Once translucent, add the ground turkey, season with salt and pepper and begin to gently break down the ground turkey with a wooden spoon. Cook until browned and set aside. In the meantime in a large pot over medium high heat bring the pumpkin ale to simmer. Turn off the heat and add the sage roasted squash and the tomato paste to the ale. Using a hand held immersion blender begin blending until you achieve a smooth texture. Thin out with water as needed, keeping in mind that you will simmer the sauce for another 5-10 min. (Alternatively, place the roasted squash inside a blender, add the tomato paste and warm pumpkin ale and blend with a towel covering the opening in the center of the lid. You may need to work in two batches. Start blending on slow. DO NOT OVERFILL the blender, the hot mixture will explode everywhere. Return to pot where you simmered the ale once done blending). Turn the heat back on, to medium low and add the ground turkey to the ale & butternut squash mixture. Add the grated Parmesan and cream, stir well and simmer for 5 to 10 min. The sauce will then be ready. Taste and season with salt and pepper. While sauce is simmering, prepare enough pasta (al dente, pappardelle recommended, boil for about 7 minutes) for 4 servings. Toss strained pasta with a lump or two of unsalted butter, divide between 4 bowls, top generously with pumpkin ale meat sauce. Garnish with pumpkin seeds, Parmesan shavings and fresh sage. Serve immediately. Pasta is my first love – this sauce looks divine. Pinned so I can make it later!! This sounds divine!!! Perfect for cold Fall evenings 🙂 thanks for sharing at Friday Frenzy Link Party!! Mmmmmmm….pasta is one of my absolute favorites. And I always love trying new sauces. In fact, the husband was looking over my shoulder and commented on how good this looks. Thanks so much for sharing at the #happynowlinkup! Comfort on a plate! These flavors in a pasta dish are everything I want these days. Now I happen to like pumpkin ale but I’m just now wondering if it’s more about the romance of having a pumpkin brew on a crisp autumn day or if it’s really the flavor I like?! I’m going to have to do some research! Great video!! Thank you Annie! I love the phrase “romance of having a pumpkin brew on a crisp autumn day”. That right there is enough to prompt me to try another one. A sample:) Since it sounds so beautiful! There is a new Atomic Pumpkin Ale here in our town (well, across America really) brewed by New Belgium. I’ll buy it this week. Last year they had a Pumpkin ale with cranberries which was interesting since there were definitely some sour notes. (But we still have 3 bottles of it in our ‘for cooking’cooler, lol). i actually have some pumpkin ale in the fridge that I need to use, but can’t stand the taste of it as a beer! def will give this a try, i love the idea of using it in a savoury dish! I know exactly what you mean Goergie:) Cook a pasta sauce with the pumpkin ale! 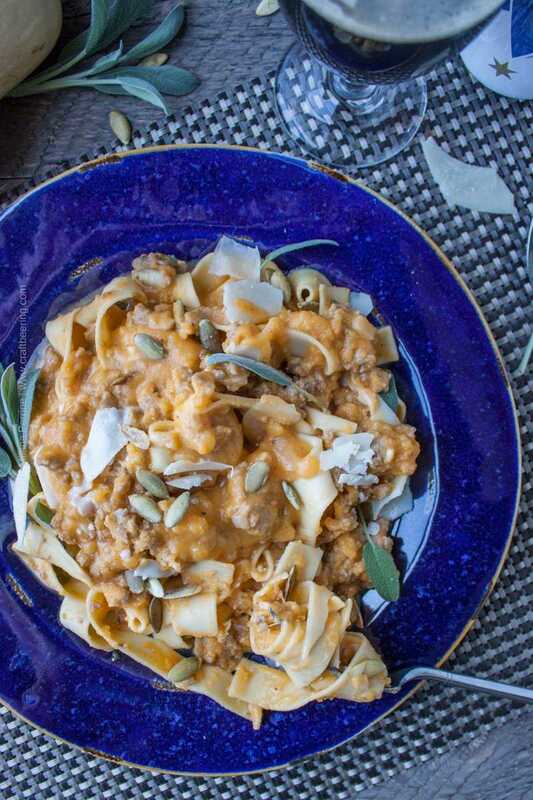 This is a pitch-perfect autumn recipe, Milena and Chris! Can’t wait to give it a try. Do you usually use a homemade tomato paste? I happen to have some pumpkin ale that this would be perfect for! Sounds fabulous and I can’t wait to try it! LOL, pumpkin ale is such a controversial one! We know people who outright hate it, won’t even make the effort to taste a new one. That is a great idea to use pumpkin in a curry. We usually default to sweet potato chunks. Squash or pumpkin would be fun, will have to try it. Thank you Marvellina! Roasted butternut squash was one of the only squashes my mother mastered, she would rosted it, add a little cinnamon and butter and the entire family was more than happy to devour it. This sauce look pretty darn tasty, I like that you used turkey instead of ground beef, I always sneak turkey into meals when no one is looking, they can never tell the difference. Loving your video!! You are so talented, I really need to get one of those cool hand mixers. Have a great week my friend. Thank you Mary:) I can almost smell the cinnamon and butter roasted butternut squash. Divine! About that handheld mixer – I always choose the immersion blender attachment over a regular blender because of the less washing required in the end, lol. So much easier! Have a great rest of the week! Oddly enough, I don’t think I’ve ever had a pumpkin ale with too much pumpkin spice. . .maybe I just blocked it out? Because drinking pumpkin pie just sounds unpleasant :). But this dish sounds totally perfect for the season. I love butternut sososo much! And with sage and pasta and some pumpkin ale, I’m pretty sure life doesn’t get better. Hope you’re having a great Tuesday! I think that it is our low tolerance level for pumpkin spice in beer that is to blame:) Always feel like it is overpowering when drinking it. One time tried a pumpkin milk stout and all I could think of is that it can go in a baking recipe (leave that to you:), but could never finish a glass of it, lol. Thank you Kelsie! I don’t if I’ll ever fully figure this whole blog thing out, lol….there’s always something to learn! I actually love pumpkin ales and look forward to them every year. The ones I’ve had haven’t been sweet (I’m not into too sweet things anyway). I bet this would be so awesome to cook with and love that your paired with another fall favourite – squash…and a touch of cream is just perfect! Great job on the video too, you guys! Cheers! Thank you Dawn! Yes, we’d much rather eat pumpkin or pumpkin spice treats than find them in beer:) It is incredible how pumpkin ales add flavor to food though. Have a wonderful week! What a perfectly Fall pasta dish! Love butternut squash and with the pumpkin ale, it must have such great flavour! Beautiful!